OREP – Organization of Real Estate Professionals, is a leading provider of Appraisers Errors & Omissions Insurance for real estate appraisers. In addition to the lowest rates and broadest coverage, that is customized for real estate appraisers to fit their individual appraising needs, OREP provides timely information to help appraisers limit their liability and increase their bottom line. OREP answers the phone, providing fast, efficient service (M-F 7 am-5 pm PST – 888-347-5273.). Many real estate appraiser E&O insurance applications from OREP are self-rating, which means you can select your coverage limits and make payment in minutes- so you can get back to appraising without any delays that can cost you time and money. OREP provides combination insurance policies for appraisers who also do real estate sales and brokering, saving you time and money and allowing you to generate income from other sources without paying more for coverage. OREP policies are available that cover individual appraisers or two or more appraisers working in the same company. OREP also offers E&O insurance policies for appraisers without any FDIC exclusion. OREP publishes Working RE Magazine, which provides content that educates, informs, and advises appraisers about current events in the industry that affect their jobs, insurance policies, and their livelihoods. 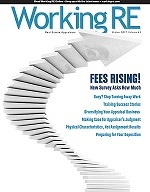 A subscription to Working RE magazine is included free to all OREP insureds. Below you’ll find a sample of some of our most pertinent stories concerning real estate appraiser’s insurance. OREP specializes in providing general liability insurance and professional liability insurance, also known as errors and omissions (E&O) insurance, to real estate appraisers, home inspectors, real estate agents and real estate brokers, mortgage field service and other real estate professionals nationwide. Providing E&O insurance to real estate appraisers for over 15 years, OREP has the expertise and experience to provide appraisers with quality insurance at affordable prices. Appraisers who purchase their insurance also enjoy a whole host of benefits to help them save money and increase business. 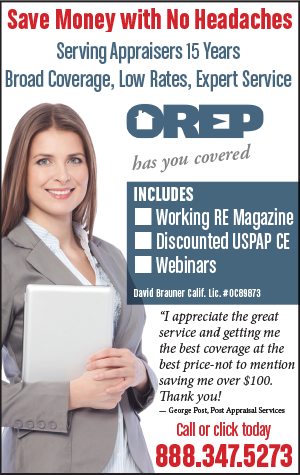 OREP offers great service, low rates, and same-day coverage/confirmation to appraisers in most cases. We answer the phone! Appraisers: Need General Liability Insurance? Click for more articles and Working RE coverage of Real Estate Appraiser Insurance.